This is my boy Red, he is just over two years old. I adopted him from the Pasco Humane Society in Florida. He was a 7 month old pup and I was his 4th owner. He was a problem dog, super high energy with no discipline, no training and a biter. He was certainly a challenge and honestly one I thought that may be beyond my capabilities for the first few months. It took about 3 months before I could pet him without getting bit, but eventually we made the breakthrough and connected. 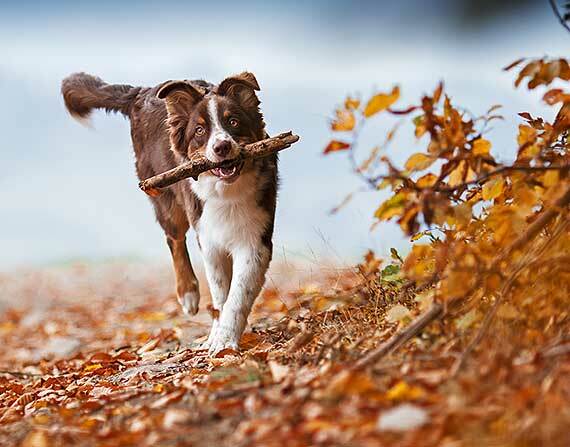 Frisbee was the key to expending his energy and allowing him to calm himself. He is still very high energy but he is now a fantastic dog, very well behaved and a true joy. I'm so thankful for him, he keeps me moving and brings me so much happiness, we go pretty much everywhere together. 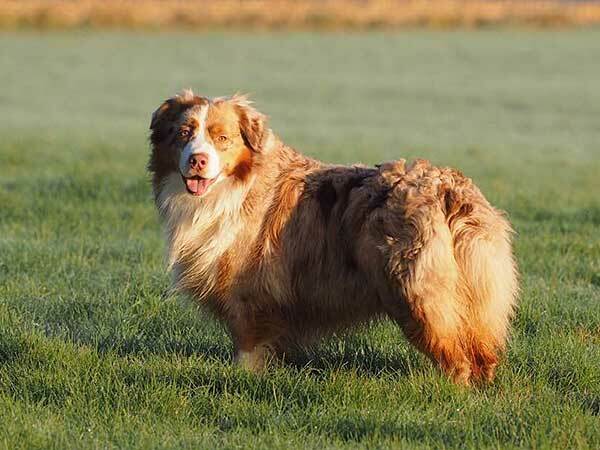 This is my lovely Aussie "Godsend Khetashio", call name Godte, from Holbaek in Denmark. He is a 5 year old male, and the most lovely dog I know. He gets along with all kinds of other animals; horses, cats, chickens—just not mice—he loves to catch mice together with our cat. Front to back: Lily, Maggie (sisters), and Daisy Mae, enjoying a day of playing at the park. My Aussie, Daisy is 5 years old and loves swimming, ball, tug of war, and loves everyone. This is Adelaide with her little Pit Bull friend Monty. 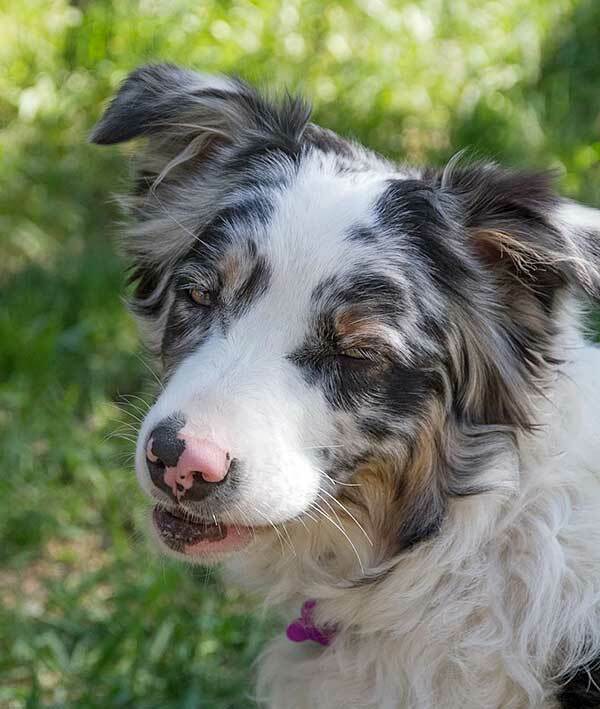 She is a double merle Australian Shepherd and that means she is deaf and vision impaired. An irresponsible breeder had her and my uncle rescued her from being put down for being deaf. She was left on a farm for 3 months in a pen. When I found her, she was matted and covered in more than two dozen ticks. I brought her home the next day and gave her a good shave (even though its not recommended the matts were too severe), bath and warm bed inside. Even though she is deaf, she is smarter than Monty and knows a lot of sign language. She loves to "herd" Monty and play in the mud. 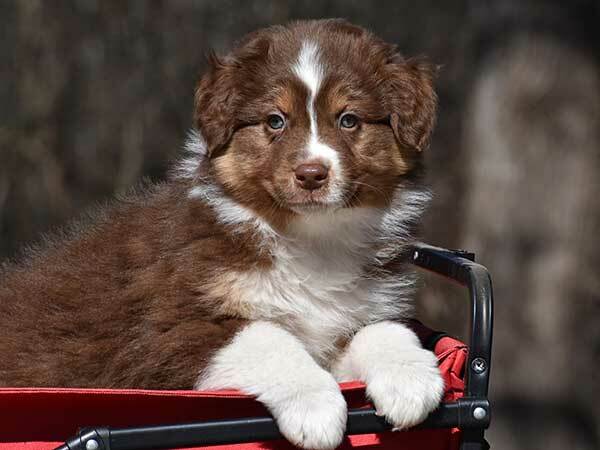 I will never condone irresponsible breeding that resulted in her deafness but I know that when double merles are born they are often put to sleep because of their deafness and I could not stress enough that deaf dogs (especially Aussies) have never been in more need of good homes than they are now. I couldn't imagine a world without my Addie. Chrome was born on May 3, the day California Chrome won the Kentucky Derby. I was in California for a conference at the time and with her black tri markings thought it was a perfect name. Chrome is a runner and her job is helping me train for running marathons. We are fortunate to call Juneau, Alaska our home and both enjoy the many beautiful trails. This picture is at Cedar Lake which is a trail near Point Bridgette. Chrome loves to run but does not enjoy swimming. Here she is watching everyone else taking a dip. She loves eating fresh berries and later found a blueberry bush that turned her white paws blue. After a long day running and hiking the trails she enjoys curling up with our cat. Chrome is very precious and I love sharing my active life with her. 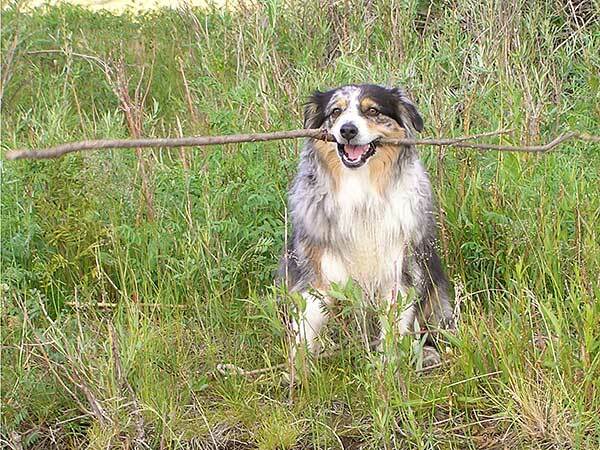 This is Smokey, a male Australian Shepherd (AKC—Smok'em If You Got'em). At the time of photo he was 8 weeks old. He likes long hikes with daddy on our ranch, but sometimes he likes to ride piggyback. He loves our 60 acre ranch to roam around on. America is a 8 week old female puppy, adopted from a small farm in Wilton, CA. She is a sweet and smart girl with striking blue eyes. Even though she is still so young she has welcomed anyone wanting to hold her with a lick on their face. 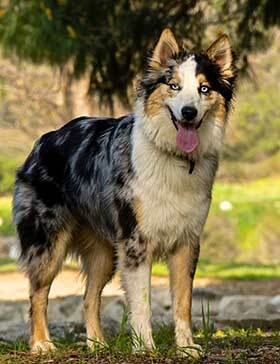 Our family has two Australian Shepherds and we live in Danville, Pennsylvania. 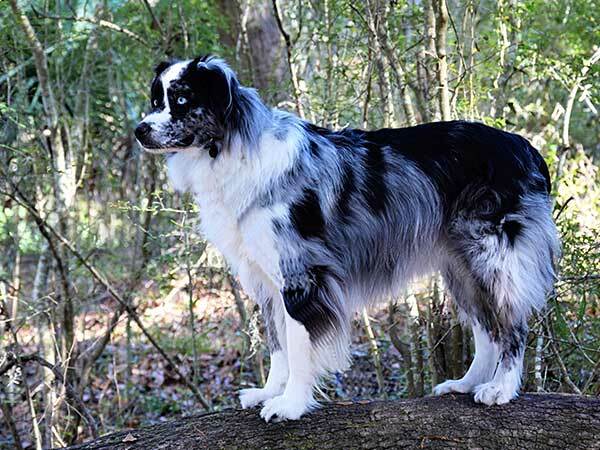 The light colored blue merle male is named Trust and he is about 5 years old. The black-tri female is named Blossom and she is 2 years old. No matter what we do to block access to the roof they find a way up from the deck off the back of the house. They have been doing this for a few years now. 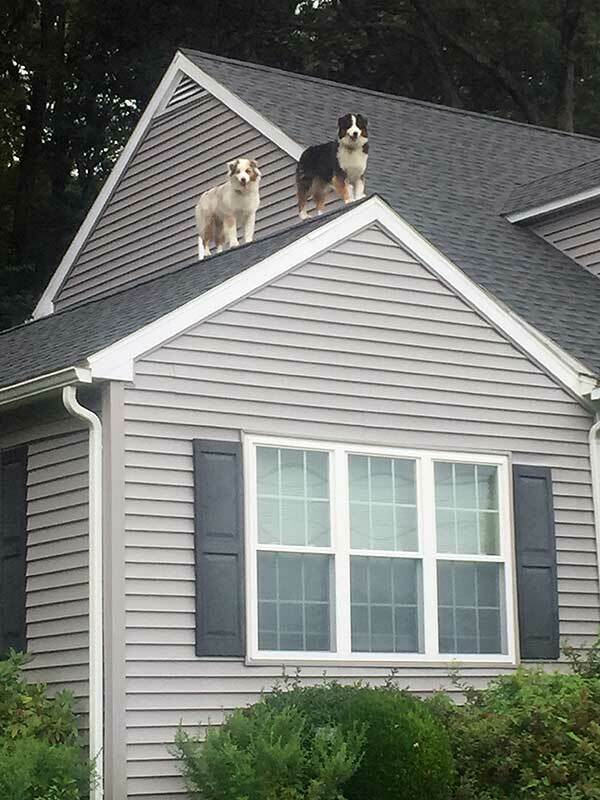 They both enjoy looking down on the people that go by our house everyday. At first I was very concerned about this behavior but now I believe it is just part of their routine in the yard. It is sometimes funny when cars stop to take pictures or construction workers alert us to what they have observed while we were at work. We love both of our Aussies and they certainly have awesome energy. I try to take them on bike rides with me as often as I can. 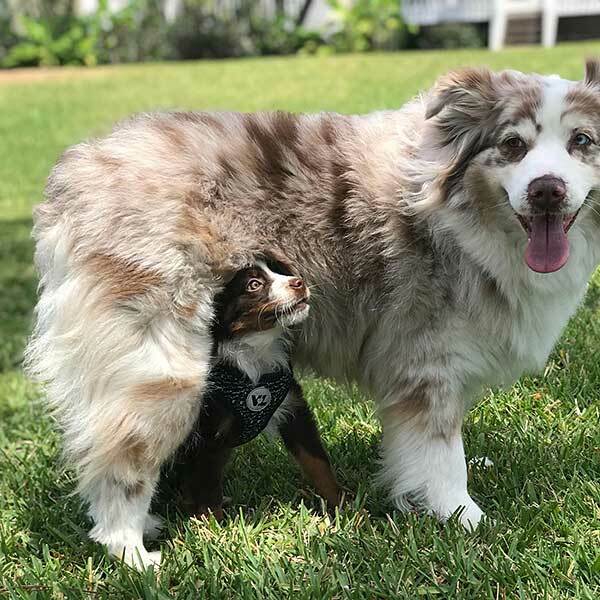 This is a photo of our red merle Australian Shepherd, Eden Faith, and our newest puppy, Emma Grace, who is a a red tri and is 10 weeks old here. This was taken in Destin, Florida while we were on vacation! My Aussie Snow and I had just finished having a good time playing in the backyard when I took this photo. It looks like she's giving me a wink and a smile—actually, she was eating grass. Jax loves our walks along the creek! We live in the mountains and Jax gets to run in the forest everyday. 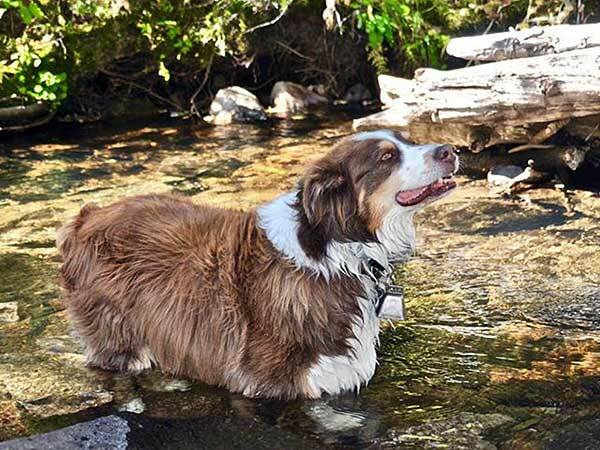 He especially loves our walks along the creek where he can lay in the water and see the little Brookies swim by! Keeva and Rowan are both from the same litter. Rowan, a male, was named for his red coat. He is my dream agility dog, competing regularly between classes. We have been very successful as a team! Keeva, a female, is a born retriever, and frisbee queen. I call her "The Manager" because she is definitely the dominant dog. In our off time, we go for long rambles along country trails. They are my constant companions and my heart's delight! This is our Australian Shepherd, Tessa, at two years old. 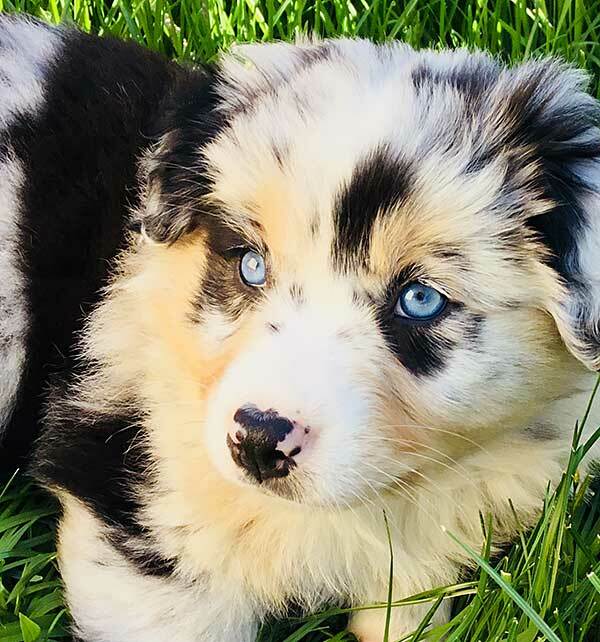 Tessa has two blue eyes and is very laid back for an Aussie. She loves long walks, going to doggie day care to play with her friends, car rides, and playing fetch with her balls. She is still a bit unsure about going into the ocean, but does love running on the beach. 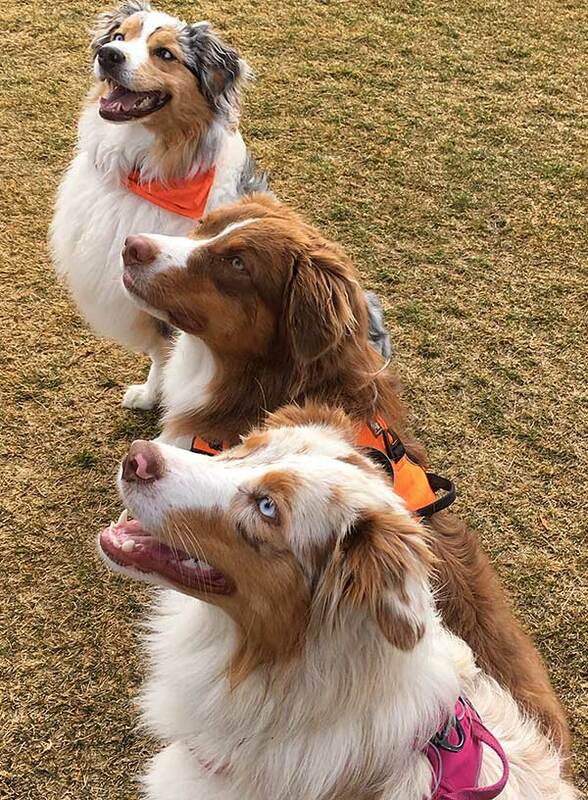 These are my beautiful girls; Scout, the red merle, and Sage, the red tri. 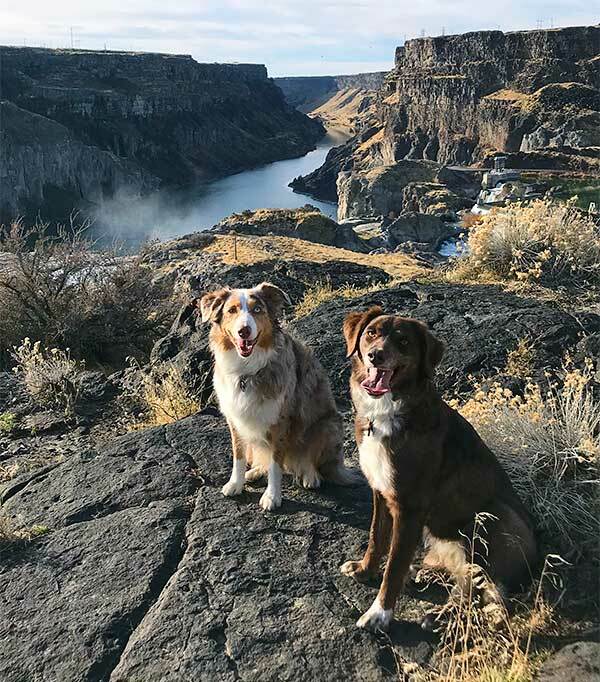 They love being outdoors, hiking and exploring new places. And while Scout is content to lounge in the shade, Sage has trouble sitting still and is always eager for her next adventure. Korah Caboose is 4 years old. She was in a cage the first three months of her life. When she had pneumonia they wanted to put her down instead of fixing her. So me being a RVT and that was always my dream dog, I asked them to sign her over to me. Now she has been my best friend my pal and we have lots of fun together. She's so smart. I would like to introduce Zoe. Being Military we are always traveling around the country and are currently in El Paso TX, at least for the next year. We took a day trip to White Sands National Park in New Mexico. This picture was taken after about 30 minutes of enjoying running and hard playing in the sand. Picture was taken with A Nikon D700 with a NIkor14-24 Ultra wide lens @ f5.6. I live in Whiteville, NC, with my husband and our 3 Aussies, Belle, Bonnie, and Buddy. 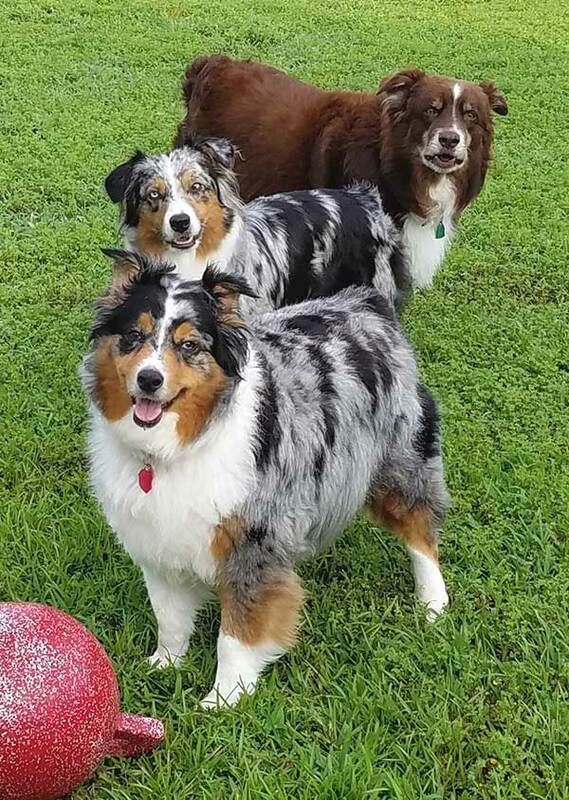 In this picture, I was able to get them to stand still long enough for the photo while they were anxiously waiting for me to pick up their ball. This is Apache. He's 7 yrs old and loves spending time up in Maine. 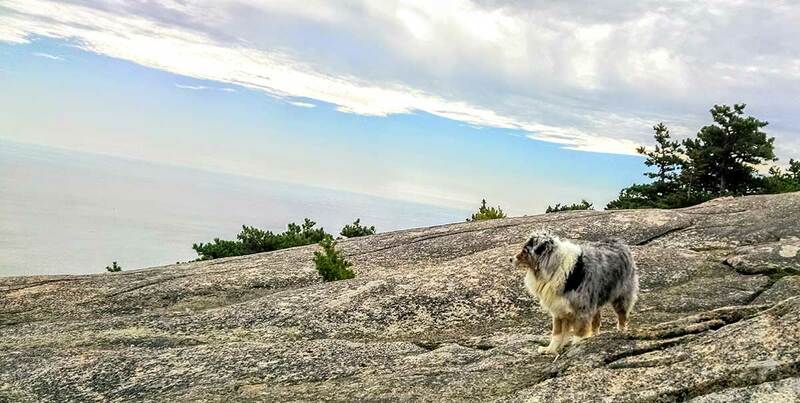 This trail he's on is the back end of the precipice; one of the most popular in Acadia National Park. This trail gets this Aussie going. In the evening he looks forward to a well deserved nap, but not for long! He's up and ready to do it again. This is my best friend Luna. She's a 1.5 year old Australian Shepherd. We work together, since I'm an assistant animal therapist. 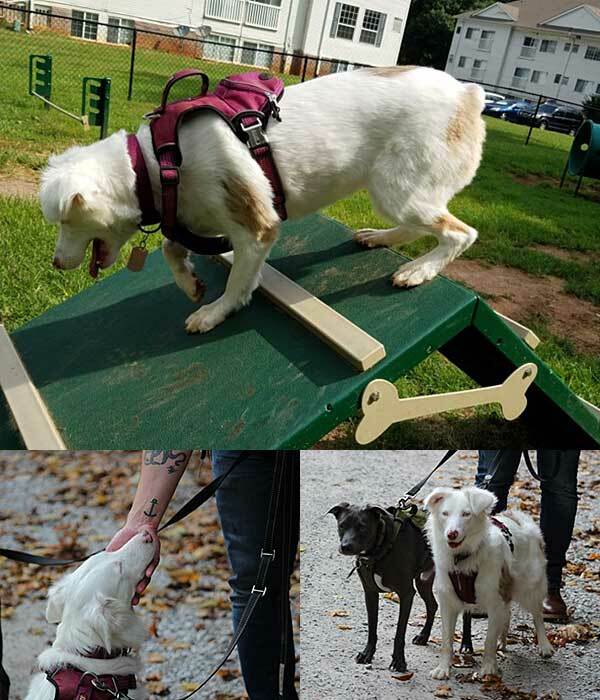 She's playful and very friendly to other dogs, people of all kinds, and kids. She isn't herding these sheep and goats, but she looks the part when we meet them on our walks. 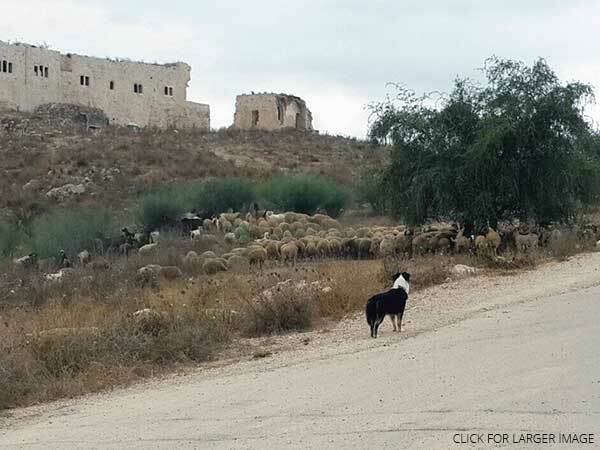 This photo was taken at place near to where we live in Israel called "Tower of Justice." It's a building from the Ottoman-era. Our beautiful female Aussie named Lola. She is 11 months old and is such a cuddly sweetheart, who LOVES to explore the outdoors. 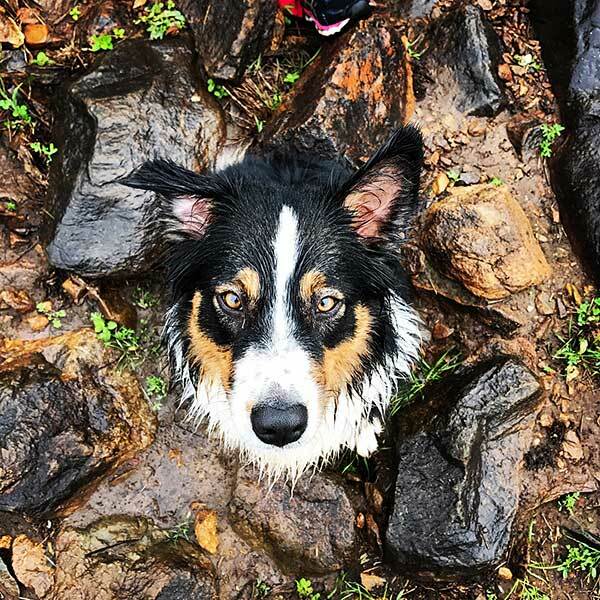 This picture was taken after a rainy morning walk at our local rapids where she got a little too brave near the water. 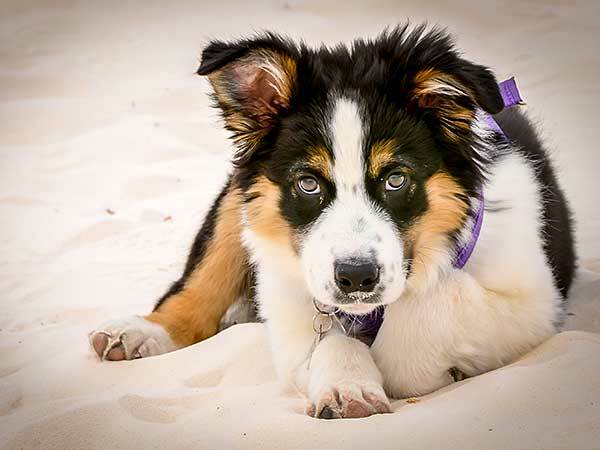 Lola lives with her family in Perth, Western Australia. This is Tinsel (AKC/ASCA Jail House Tinsel Town CGCA, JHD-g, JHD-s, DNP-vp). 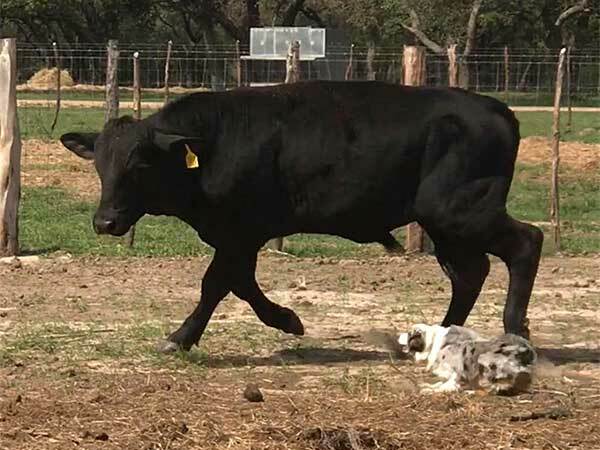 This black tri girl is my right hand when it comes to moving cattle or goats. She is high energy but at the same time a love bug. She loves everyone and especially people with a physical condition. I never had a dog that could read my mind or body language until I got her. She was my first Aussie and I now have a total of three. 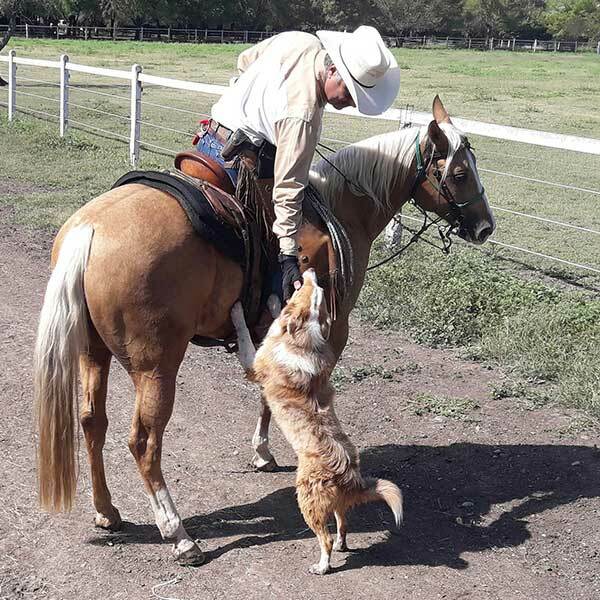 She loves herding, frisbee, and rally but most of all being with me doing ranch chores. She goes with me when I'm hauling water (has to ride on the tractor), and when feeding the horses and chickens. Zor is an amazing soul! We met when he was 5 months old and at 9 months old he is a loyal companion. 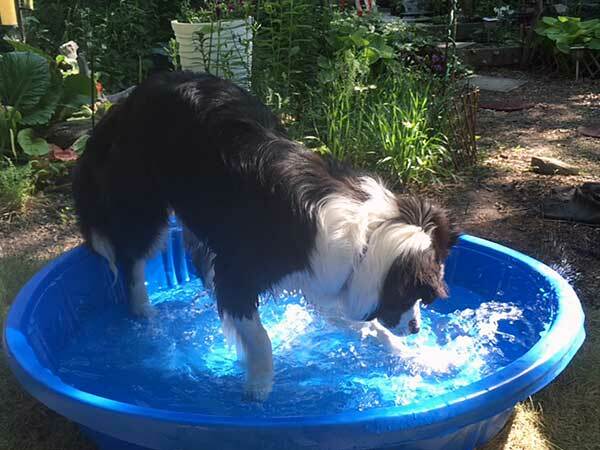 With summer finally arriving, Zor got his own wading pool and discovered he can splash... now to catch those splashes! 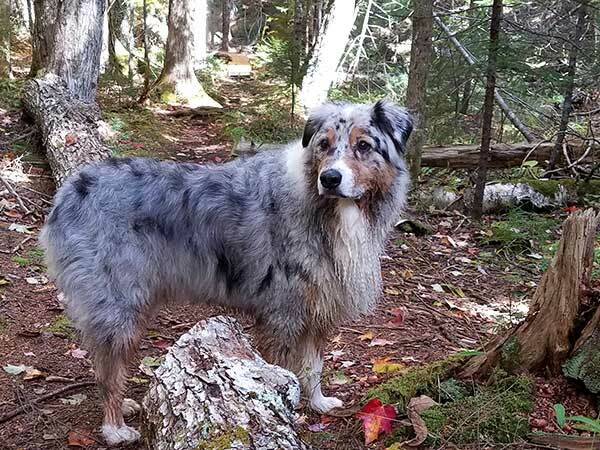 This is beautiful Sky Blue, our 3 year old blue merle. This photo was taken during a hike while camping at Blackwater River State Park in Florida. 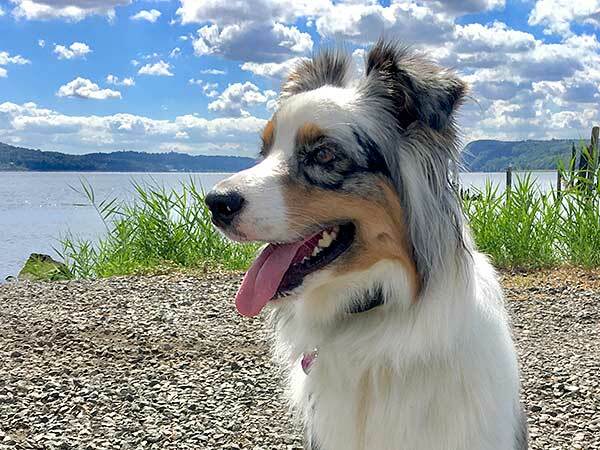 Sky is our second Aussie and is always ready for an adventure like this. There's nothing he likes better than to explore with us. He loves riding in the truck, camping with us in our trailer, and running alongside us when we bike. Limitless energy and limitless love. Greetings from Mexico! 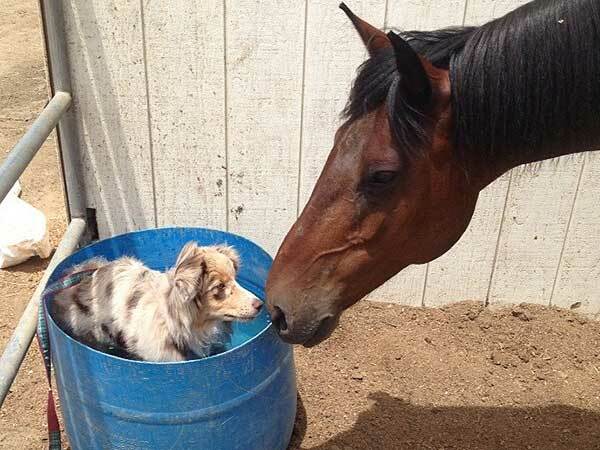 This is red merle Aussie, Luca, and the name of the quarter horse is Pepto. Lexi is 2 years old and a princess. She loves to lay in the recliner and be rocked. She also loves to work cows every chance she gets. She is the all around best dog you could ever ask for. 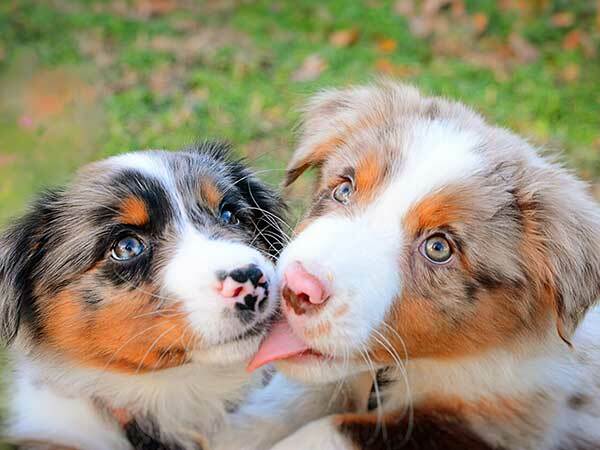 Caprisse is the blue merle and Crimson is the red merle. 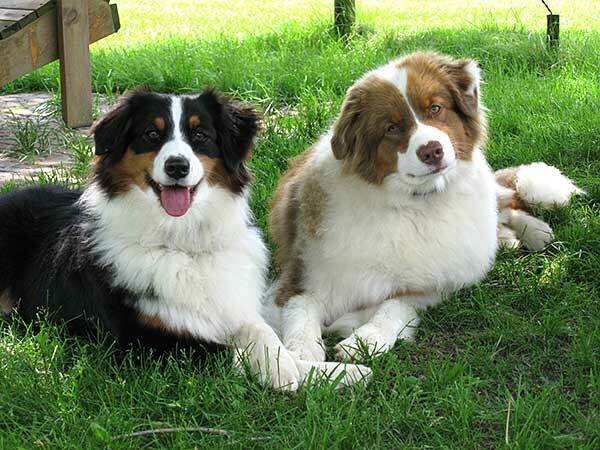 Two wonderful and highly energetic Aussies who are very loving and intelligent. It is taking some time to potty train them but they're barely 9 weeks old and already are capable of doing a few tricks such as "sit, lay down, roll over, and up." We can't believe how fast they learn! It helps a lot too when we train them individually. This is Apache, he's 6 years old. 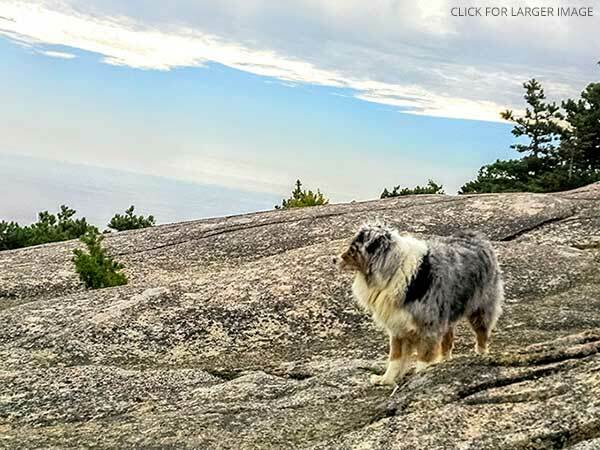 He loves doing his Aussie thing in Acadia National Park in Maine. He makes the trip up there twice a year from Brooklyn, NY. 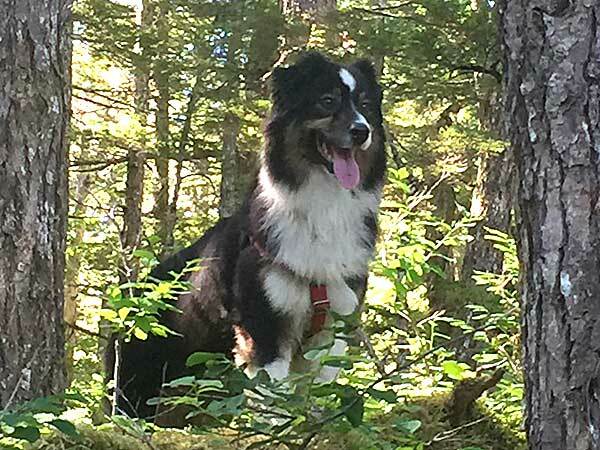 It's a joy to see him romp through the woods and streams. 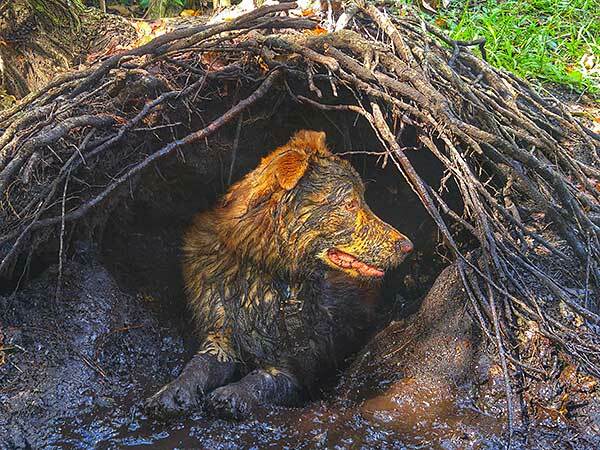 If he's not dirty and wet he hasn't started having fun yet. Thelma is a sassy, energetic 5 month old girl. 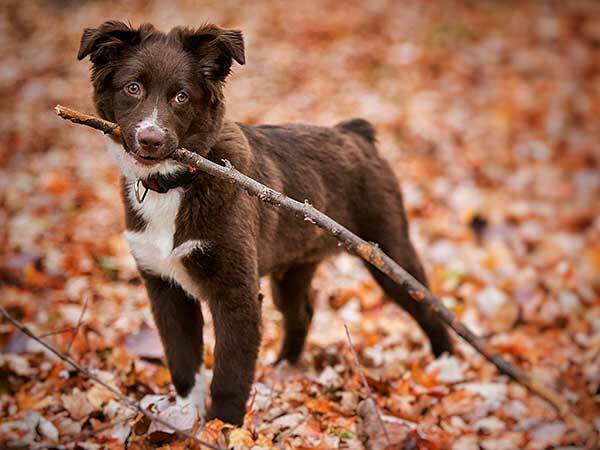 She picks up every stick we see on our walks—the bigger, the better! Thelma has been great therapy for some sadness that our family recently faced. She's brought smiles to our faces every day since she joined our "pack." We adore her. This is Dottie. 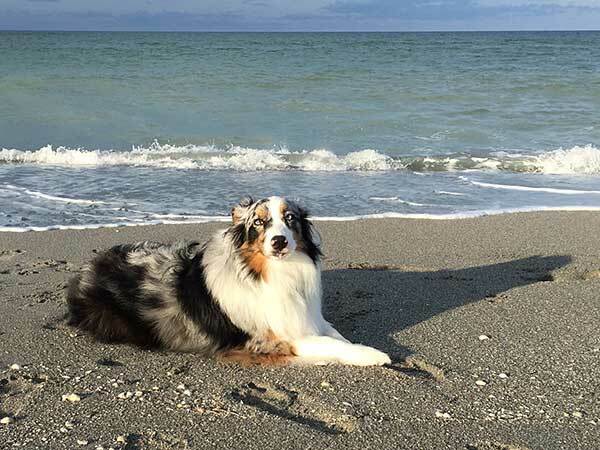 She is a 3 year old blue merle with a passion for travel. She has lived in or traveled to 10 different states in her young life and currently resides in Old Tappan, New Jersey. Always looking for a frisbee or ball to play with, she is the best companion a family can ask for! My Aussie's name is Maybel. She is 5 years old and is the love of my life. This picture is from this summer on the Yellowstone River. It was evening time and we had just launched our drift boat on the water and decided to pull over for a doggie potty break and some exercise. 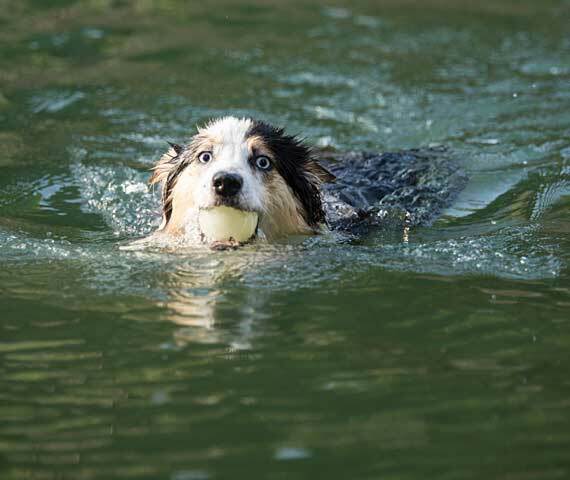 Maybel loves to swim and fetch sticks in the water so of course I had to share this one. She's a large female (64 pounds) and is the best companion I could ever ask for. This is my Australian Shepherd, André, at 15 months old. He is a real geyser of energy and is always in a good mood. He is my first dog and is definitely my big dream come true. This photo was taken during a walk in autumn in a beautiful place called Wallachia. 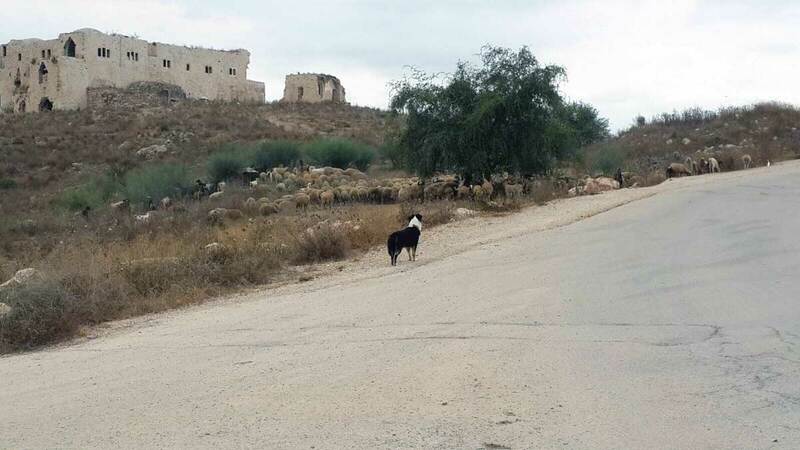 On December 9th 2013 at 6 AM in the morning in So Cal at our ranch I was out with my Australian Shepherds, Bailey and Cooper, and saw what I thought was a coyote. All I could see was a shadow of this figure and it was coming closer. We had a female Coyote that had lost its mate earlier in the year and took to following us around the ranch on our early morning work out. She followed about 50 yards back and wanted to connect but her nature would not allow it, nor for that matter would Bailey or Cooper have invited this action either. So I thought for just a moment, she has now decided to connect. This is going to be interesting (so I thought) until I could make out now what I thought was a Husky due to the ears and then as she approached I could make out the blue merle coating and no tail. 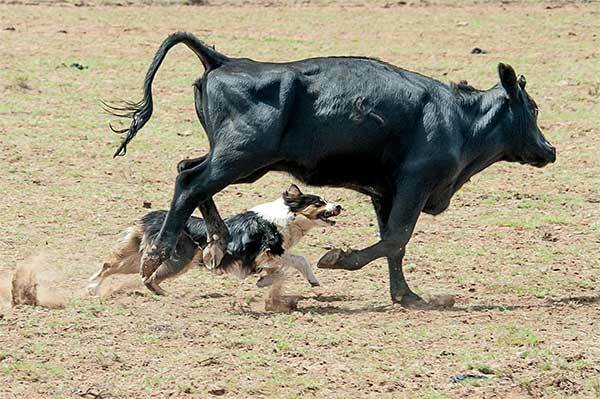 There was an usual dance between the ranch dogs and the new dog and every one seemed to get along. She was very shy and in fact still is. She was the 55th dog that has been dropped off at our place in the past 20 years and we have taken care of each and every one by finding homes for them in one way or another. So this is how Abigail (Abby) came to be at our place. She was so pretty and such a lovely animal we decided to keep her and we have enjoyed every moment with her. 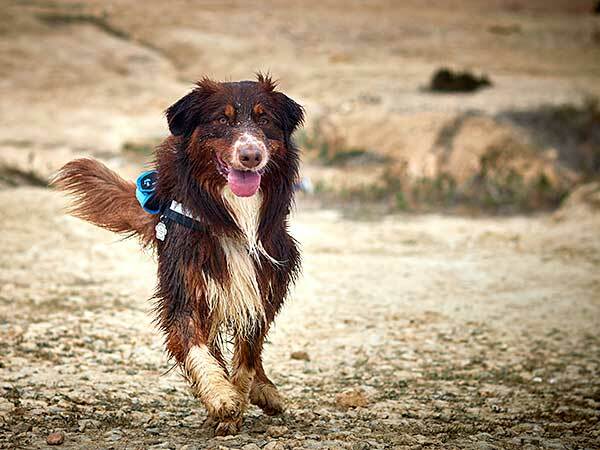 She has turned out to be one of the best at agility, Frisbee and sheep herding. It goes a little bit against our Aussie only policy but this one we had to make an exception. We love her dearly. 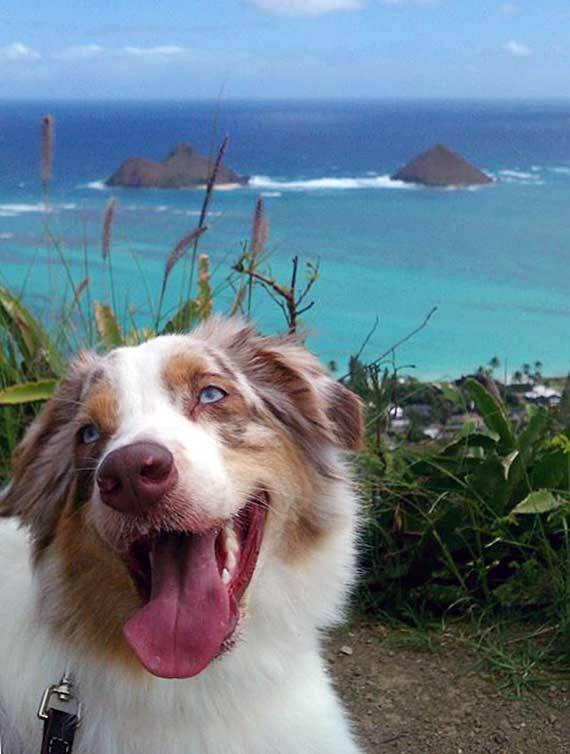 This is Alexio my four year old happy go lucky Aussie from Kailua Hawaii. He loves to go on hikes and loves to swim and herd the waves. At home he's content to chew his favorite squeaky ball and frolic with Max our cat and Bella our Maltese. Xenia is a 3 year old tri Australian Shepherd who lives in Valdosta, Georgia, USA. Xenia loves all living creatures. 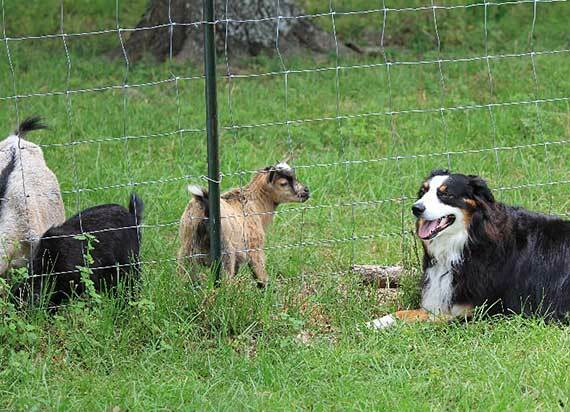 After we moved about a year ago and discovered there was a herd of goats just across the field from us Xenia adopted these goats as her own herd. Every day we must visit them and she loves sitting near the gate for hours. Xenia is quick to tell them to stop fighting and when one wanders away she will call them back to the herd. After noting that the goats were not being well cared for we began bringing goat food and fresh water to them. Xenia lets me know at the exact same time every day that we need to go on our walk to feed her herd. Xenia's favorite goat "Gazelle" just had babies. Even though Gazelle is very friendly with Xenia (touching noses), her babies are still shy and stand back away from them fence. Xenia lays by the fence as still as possible. She keeps her eyes on the babies but turns her head when they look so not to make eye contact because she knows it scares them. After 3 weeks the babies are getting closer and the male is curious. Today, he stuck his head through the fence to sniff Xenia. I missed that shot but I just Love how Xenia displays the Aussie patience! Our Aussie Jasper lives with us in Gilbert, AZ, a suburb of Phoenix. 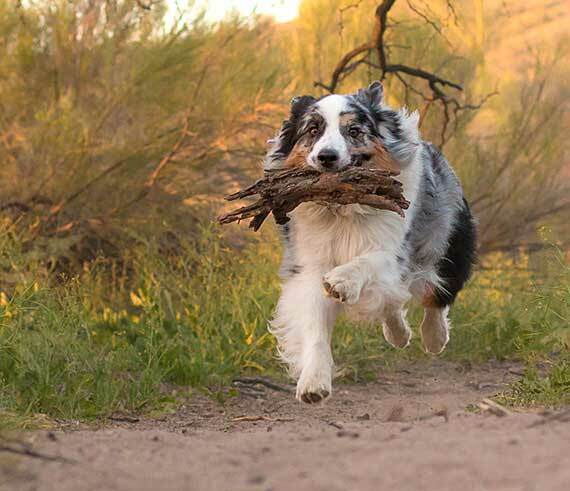 We often hike along the Salt River, about ½ hour from our home where he finds treasure that gives him the zoomies. It's so much fun to witness the joy that a simple piece of bark or stick can bring him. I'm pretty sure he's the most loved dog in the Phoenix area.